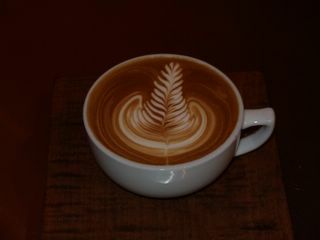 here's another layered one with the larger leaves. Well....USBC is done...It was like espresso camp. Meeting all sorts of new people. Making great espresso, talking about espresso, just hangin out. Comming back home was a bit dissapointing....but thats reality. i Came in 8th in the opening round and sevententh in the semi-finals. I'd say that is pretty good. This year was my first year making a bid for the USBC title. I screwed up on my signature drink...and I went 3 seconds over time. ouch. But the things that got me excluded from the top were small things that had a cummulative effect. Like how hot my cups were, the taste of a couple cappuccinos, Foam on the caps, espresso being highlighted in the sig drink...I thought it was but they were really looking for less complicated flavors. etc. I got my score sheets in the mail today...It's amazing just how subjective this whole thing is. I will be studying them for a bit getting ready for next year. This time the USBC is in Charlette, NC....so we can drive down rather than fly...whew. It's easier on the budget and on the equipment. Now for some needed rest. News on other fronts... 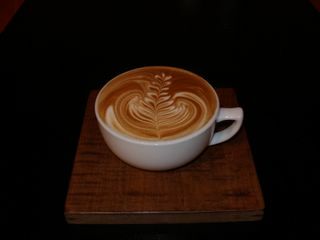 I am taking side jobs with Bellissimo doing training and latte art. I will be flying to Texas this monday to train for a day then fly back. This is a great opportunity for me to hone my skills as a trainer and to invest into my professional future. Praise God! Also. I am moving this month...I don't have a place yet but by may 1st I should. Spring...and it's raining...today is the first day of the famous Ithaca Farmers Market...truely a sight to see and an experience to experience. I think I might drive up to a maple festivle being held 45 minutes from here. I am into trying to perfect others techniques...like Schomer etc. I think that if you get to know your medium as an artist you can do fairly good reproductions...same with latte art. You ever say...how did they get that design?...if you know how milk reacts when it hits espresso...you can get it in a few trys. Here's a couple...one explores the layered effect at the base. 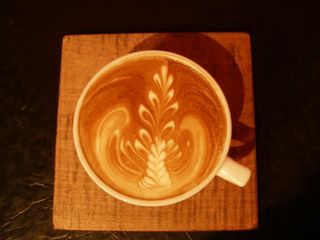 The other takes the Schomer style big leaf latte art and adds the super imposed leaf at the bottom. Enjoy. I've got back into the swing of things here.